Originally released as limited CDR in 2013 on Oppressive Resistance Recordings, Cipher Productions have seen fit to reissue this on vinyl with all new artwork and 3 lengthy remixes appended for good measure. Thematically the album functions as a direct homage to to Lars Von Trier’s film ‘Antichrist’ (….or perhaps can be considered an alternate soundtrack of sorts? ), and certainly manages to capture the mood of mental anguish and emotional desolation of the film. 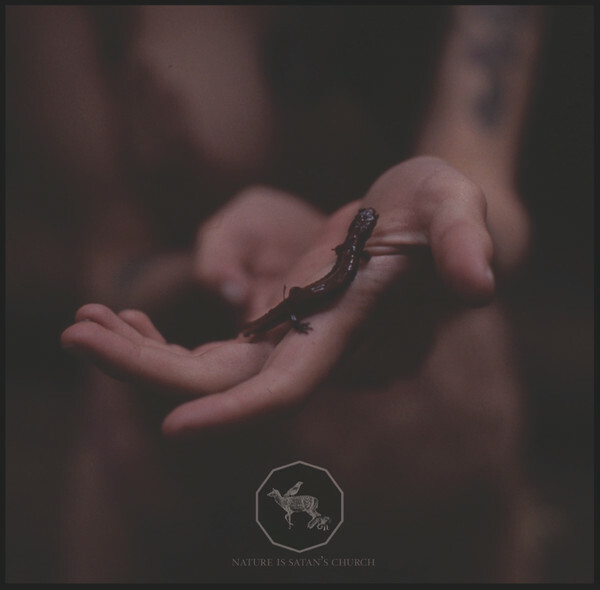 Sonically speaking this music found herein is far removed from what might be typically expected from either project, where ‘Nature Is Satan’s Church’ features industrial orientated drones and minimalist dark ambient soundscapes (…which then verges on the isolationist ambient side of things at times). In then tying back to its inspiration source, this minimalism has replicated and expanded upon the the harrowing and starkly minimalist sound design (…which is only fleetingly employed within ‘Antichrist’), while each of the 6 album track titles specifically replicate each of the chapter titles of the film. ‘Prologue’ commences the 6 main album tracks and sets the scene with a moody series of orchestral type loops and a lone female choir vocal sample, which is clearly a nod to the music of film’s opening chapter. This track then turns out to be the most ‘musical’ on offer (…which again is reflective of the film’s sound score) and functions as the gateway into a slow descent of creeping anxiety and rising dread. This is particularly demonstrated on the second track ‘Grief’ with is foggy enveloping ambience and sonically wintery landscapes, but later in the piece it ramps up with added windswept force (…including a section of echoed knocking tones which creates a haunted basement vibe for exceptional effect). ‘Pain (Chaos Reigns)’ on Side B is structured around a series of minimalist but quite forcefully driving loops with gradually elevating momentum which culminate in foghorn styled intensity. ‘Depair (Gynocide)’ continues the album’s established dank and oppressive minimalism mixing layered bass rumble, and a heavy dose of echo and reverb, while ‘The Three Beggars’ continues a comparable droning blast furnace styled approach. ‘Epilogue’ rounds out the final of the main album tracks with an general sense of stasis, where its gradual sonic fadeout drags the sound down into ultimate oblivion. With the 3 re-mix tracks, these broadly maintain an underlying feel and mood of the source material, but also provides individualistic sonic flair on each. Four Pi Movement features first with ‘Despair Remix’, where the mood of this piece features some prominent and driving ‘cosmic’ type synth elements. Worms of the Earth follows with ‘Chaos Reigns Remix’, which is sonically more consistent with the source material, but here with the main augmented/ additional elements consisting of driving synth melody, sparse percussion and sampled Gregorian chants for excellent ritualistic result. Iszoloscope then rounds out the remixes (…and album overall) with ‘Pain Remix’, being a quite minimalist drone affair and generally closest to the sound of the main album tracks. Having heard this previously this via its original CDR edition, I did observe that due to its sprawling scope, minimalist construction and continuous soundscape format, that if full and attentive listening was not facilitated you could get lost along the way as to exactly which track was playing. While this is not in any way a criticism of the music, I do perhaps feel the vinyl format is a much better fit for this album as there is ongoing engagement with the material due to having to change sides as the album progresses. As for the cover, the photography courtesy of Gretchen Heinel functions as a stunning visual counterpoint the featured sonics, which also appears to pay homage to the style, colour palate and visual mood of ‘Antichrist’. Overall this is an excellently realised release: from concept, to visual representation and ultimately its sonic execution and should not be passed over despite its limited pressing of 150 copies. This entry was posted in 2016, Cipher Productions, dark ambient, drone, industrial by noisereceptor. Bookmark the permalink.